I have given many lectures on the Wheel of the Year and have enjoyed every one of them, for I get to hear the experiences, observations and wonder of people who have been actively guiding their lives by the seasons of nature. I could write a book on this topic and still only have scratched the surface of the benefits of living this way. I will not do that here… But I tell you that it is a magical experience to watch your life grow into a purposeful and accomplished one. Remember that we wax into and wane out of each of these High Days – or pinnacles of power – of each season. Next, think of your life as being divided into many "fields". Such as: the field of our mental or analytical thoughts, of our active or spiritual endeavors, our emotional lives, and our physical lives. To state a few examples: we all have the field of our job or career, the field of our creative works, the field of our spirituality, the field of our friendships and lovers relationships, the field of our family ties, a field of taking care of our health and that of our children, companions and loved ones, etc., and keeping up our homes, as well as our fields of dreams, aspirations, and future plans. I'm sure you get the point of what I mean. Each one of these fields of our endeavors is affected in a positive or negative way by how, or whether, we live on the Wheel of the Year. The Wheel of the Year is symbolized as a great wheel with eight spokes. Each spoke represents a phase - or season - of the year. And just as is the case with the phases of the Moon, each phase, or season, waxes into the pinnacle of its full strength and then wanes out of its energy. The pinnacle of power or energy of each of these seasons is celebrated as a High Day or Seasonal Festival, usually with a ritual, complete with an appropriate Passion Play signifying the focus of each season of the year, with one symbolic act that IS the actual turning of one cog in the wheel. “Click” – and the job is done! Feasting and/or other festivities - such as dancing, singing, chanting, drumming, or workshops - along with companionable conversation and fellowship usually highlight the day and/or evening. I think that the best way to understand the Wheel of the Year is to draw a large circle on a page of paper, allowing a couple of inches beyond the circle to the outsides of the page. Then draw one vertical line directly from the top of the circle to the bottom. Above the top of that straight vertical line you should write ‘Winter Solstice’ and several spaces above it write the word ‘North’. Then at the bottom of that vertical line, write ‘Summer Solstice’, and several spaces beneath it right the word ‘South’. Note that in addition to its coming together as a map of sorts it also resembles a clock, with the Winter Solstice in the position of 12 o'clock, and the Summer Solstice in the position of 6 o'clock. Next draw a horizontal line from one side of the circle to the other (east to west), where the clock position would be 3 and 9. Outside where the 3 o'clock position meets the circle, write ‘Spring Equinox’ and ‘East’, and of course opposite it write ‘Autumn Equinox’ and ‘West’. 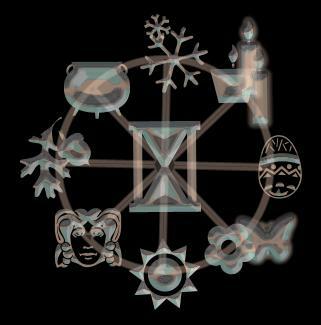 Now you have the four positions of the Solar Festivals. Next, draw an X upon the circle, equally dividing the spaces between the solar points. Moving clockwise (sunwise or deosil) beyond the Winter Solstice, to the first juncture of the X, write ‘Imbolc’. Proceeding beyond the Spring Equinox, to the next juncture, write ‘Beltane’. Continuing around, skipping the Summer Solstice, you will come to ‘Lughnasadh/Lammas’. Next, past the Autumn Equinox, is ‘Samhain’. These are the 8 Festivals – and seasons – of the Wheel of the Year. Now, equally dividing each "piece of the pie" draw a dotted line... These represent the "Points of no return" - to delineate the waxing (drawing into the energy of) and waning (releasing or declining from the energy of) each season of the Wheel. Here is a list of the names of some of the Pagan, Wiccan, and Christian High Days, as well as the significances and approximate dates of each, and a keynote phrase or word to serve as the focus of each season – as I teach it. Example: Christmas is celebrated on 25 December. Christians believe that Jesus is the light of the world, so the early Christians thought that near to the Winter Solstice was the right time to celebrate his birth. Then many of the customs from the Roman (Saturnalia) and other European Winter Solstice celebrations, (Scandinavian Yule/Jul) were adapted to give them Christian meanings, like Holly, Mistletoe, the Yule Log, Christmas Carols, and many more. "Bless the new born Sun!" (Son) The Child of Promise… Promise that the light will return to the Earth each year. Focus: "Season of Awakening & Planning and of gathering your ‘tools’ toghether"
Focus: "Season of Planting Seeds, of Beginnings, and of Balancing Relationships"
Focus: "Season of Fertilization & Tending"
Focus: "Season of Claiming & of Peak Power "
Lughnasadh: "Games of Lugh". Lammas (Loaf Mass). Feast of the Ascension of the Christ. Blessed Virgin Day. Grain & Herb Harvest Festival. Focus: "Harvesting the Fruits of this year’s Labors"
Focus: "Season of Death (Endings) and Forgiveness"
Near the waxing into each of these High Days, I will write an article about the upcoming one and post information here, and different information on my author's website - RowenaWhaling.com. I plan to have a lot of fun sharing this with you and hope that you will enjoy it in turn. On the insert pages of my CD "Book of Shadows", I have photos, some notes written as a journal, and song lyrics appropriate to those notes. Also read my article on the Wheel of the Year at my author site RowenaWhaling.com for even more information!